150 Ft drain cleaner comes installed and ready to use on a high-pressure reel. 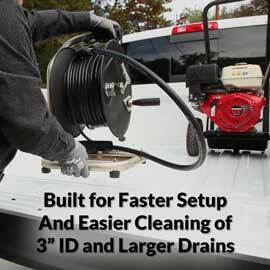 Recommended for PVC main drains, landscaping drains and septic field lines. Scrub away grease, sanitary paper, food residue, silt, leaves, and other clogs. 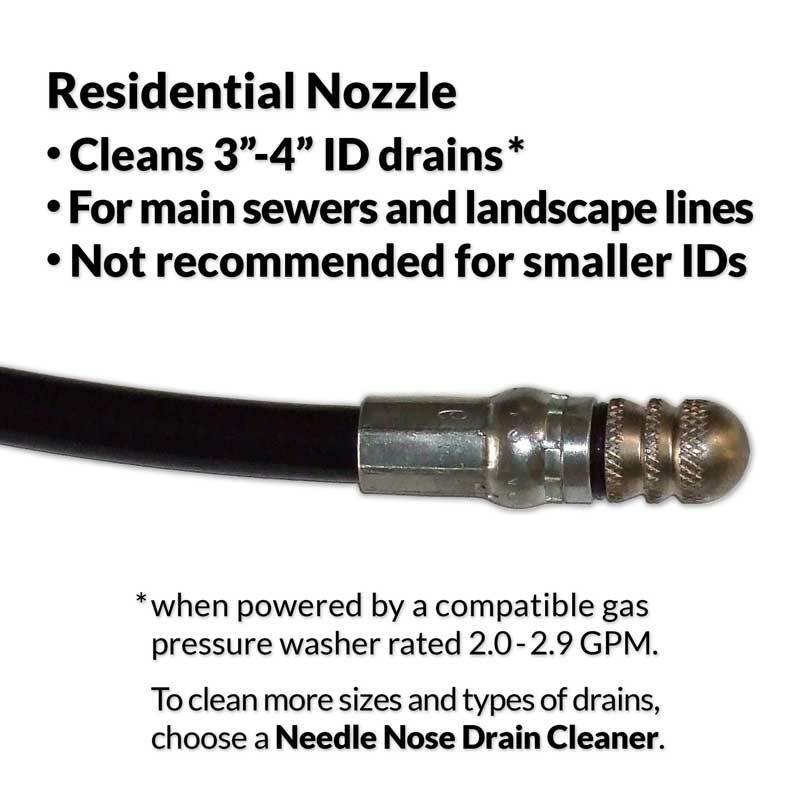 Powers itself deeper into 3" to 4" ID drains— not recommended for other sizes. Important: click the Compatibility tab for pressure washer information. High thrust nozzle has four back jets for extra pulling and scrubbing force. Professional grade 150 foot sewer jetter hose is wear-tested for durability. Exclusive Kynar® jacketed power end for maximum cornering and glide. Complete with an adapter to fit most gas machines' high-pressure hoses. Heavy-duty steel reel has rugged construction for professional use. Built-in high-pressure swivel allows faster drain cleaning. Includes a heavy-duty inline trigger for easier two-handed operation. Has a convenient wind-up handle for fast coiling of the hose. Pull-and-twist locking ring keeps the jetter hose stowed when not in use. Important: only Handy Jetter orders with valid pressure washer information entered at Checkout can be shipped. Click to find out why. No opened returns. Click for details. Most Residential pressure washer hoses have M22 Twist fittings. For these choose For Pressure Hoses with M22 Twist Fittings - M22 Male Adapter on this page. 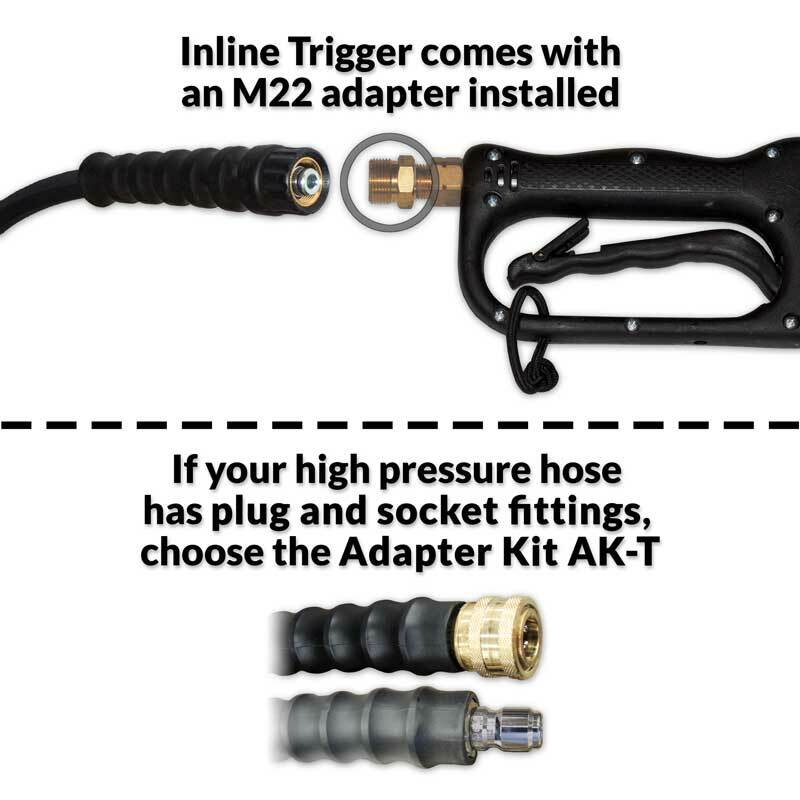 If your Residential pressure washer hose has unusual 3/8" Quick Connect fittings, choose For Pressure Hoses with 3/8" Plug or Socket - Adapter Kit AK-T on this page. Get the Needle Nose Drain Cleaner. 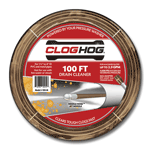 Drain Cleaner Length: 150 Ft.
High Pressure Line OD: 0.38 In. 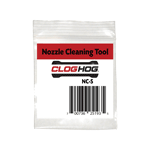 Miniature spiral-cut tool helps you quickly remove debris from nozzle jets. Close-range nozzle and accessories for Residential Handy Jetter. High-thrust replacement nozzle for your Residential Handy Jetter. 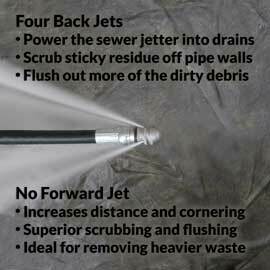 Steel-belted sewer jetter cleans more kinds of drains from 1-1/2 to 4" ID. 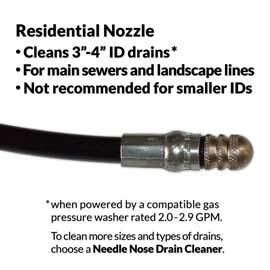 Cleans smaller diameter drains down to 1-1/2" ID. New! 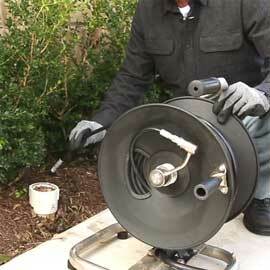 Extend or replace your pressure washer hose, only for use outside of drains. Adjustable, 100% cotton relaxed twill hat. New! Having the jetter on a reel makes weekly use and transporting much easier. I'd like to see adjustable tension for the spool and a fold able handle. I very satisfied with my purchase. Carl, thank you for your comments. We've tested high-pressure reels that have tension adjusters, and found that this feature can sometimes make sewer jetter hose spool out less predictably. It's usually possible to remove any slack in the line by engaging the Handy Jetter locking ring. I bought the clog hog to clean my footer and downspout tiles. It exceeded my expectations even on a 1900 psi and 1.9 gpm pressure washer. One of the most effective tools I have ever purchased. Mike, thank you for your review. We normally discourage home users from buying a Handy Jetter because it's designed for service pros who must frequently transport the sewer jetter to different locations, and is usually not cost-effective for a single plumbing project. We're glad the product worked for you this time. Great unit did everything we needed to do. Really only two words works great. Worked great! Exactly as advertised. I used the 150' Residential Handy Jetter on a clogged footer drain. I needed at least 100' of hose for this drain. The Handy Jetter pulled it self into the drain and unclogged the silt/debris in the drain. Very happy with this piece of equipment! We really like our Clog Hog and how easy it is to use. This has opened up a new profit center for our business, and we are every happy with our Clog Hog. Have used it a couple times works great. Everything fits and is easy to use. Thank you for your comments. The Handy Jetter is designed for service professionals who are experienced sewer jetter users and must transport the drain cleaner to many different locations. Users who don't frequently clean drains can contact us with their pressure washer manufacturer and model number, and some details about their drain cleaning project(s), and we'd be glad to recommend the most economical solution. Very pleased with the Residential Handy Jetter I got. I use it for my rental houses and have probably saved $1500 since I got it in service calls. It has worked every time for me and it busts through the clogs so quick I save $175 plumber call for 15 minutes of work. This is my second purchase from Clog Hog. First was a 50' jeter that works excellent but was just short to clean my main line in one shot. This 150' Handy Jetter is top notch and well built. The hose and nozzle are Made in USA and the trigger/handle is made in Germany so no cheap parts here. Very happy with purchase. Russ, thank you for your review. As you mentioned, your Handy Jetter sewer jetter hose and nozzle are manufactured in the USA, and the trigger gun is made in Germany. 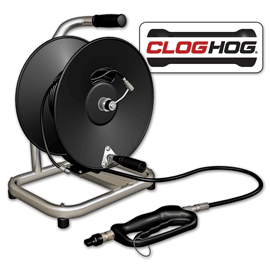 Clog Hog works with a large US hydraulic equipment manufacturer to design and build the steel reel and carrying frame, and while their engineering staff is USA based, their manufacturing facilities are in the USA, Europe and Asia so the finished Handy Jetter is assembled in the USA using components from all of these regions. Does a great job, cleared clogs a snake didn't, used with a camera to verify. I own a small plumbing company. I have already used this product at least 6 times on 4" sewer piping (cast iron, clay tile, and PVC). Seems to be great quality. Would be nice if the reel had hose clamps on it to secure the jet hose and supply hose during transport. I have recommended this product to other plumbers already! Chris, thank you for your review. When you're through using the Handy Jetter, you can pass the nozzle tip through the stretch loop that hangs the trigger onto the carrying handle so that the nozzle doesn't move in transport. This might be easier than attaching a clip to the hose. I called a plumber to clean out my house floor main sewer drain. They cleared the drain and $300.00 bucks later they left. I watched them do what they did and of course realized this isn't rocket science by any stretch. They used a traditional drain snake. I thought to myself for $300.00 bucks I could have bought a snake myself. 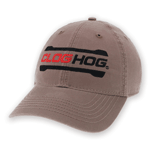 Just out of curiosity, I googled which led me to "Clog Hog". I watched the videos of how it worked and how it was supposedly better than a traditional snake because of the way it "washes" the walls of the pipe as you pull it backwards. Well, I can tell you I think it IS better. I bought it to have on hand for the next time a drain clogged. Well, a few weeks went by and the drain for all of my gutters than runs underground, all the way to the street backed up outside. 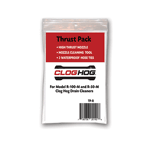 I busted out the Clog Hog and found it very easy to hook up and use. The pressure that it puts out rearward, really does pull itself through the drain. Once you get up towards the 100 foot mark, it doesn't pull itself quite as well because it is pulling a lot of its own weight, of course. but if you give it a push, it will continue to go. It isn't difficult. Much to my surprise when I pulled the Clog Hog backwards, thus cleaning out the drain pipe walls in reverse, out came a wiffle golf ball and a bunch of crap! Then my memory kicked in. Last summer over a year ago, my son was hitting wiffle golf balls over the house from the front yard to the back. One of them landed on the roof, never to be seen again, until now. It obviously went into the gutter, and down the downspout into the drain. Then inside the drain, it had a year to collect crud and clogged the drain. I don't believe that using a traditional drain snake would have ever retrieved a wiffle ball. I think a normal snake would have forced its way past the ball and opened the drain up partially and temporarily. That jet action blasting backwards really pushed the ball out and I have no doubt that it cleaned the drain better than a regular snake would. So not only did it just pay for itself, but I bet I have a cleaner longer lasting open drain as well, as compared to paying a normal snake using plumber several hundred bucks. My only complaint... and I'm not even sure it is a complaint. Some of the youtube videos show the nozzle as having several rear facing jets and then one in the front also to blast through clogs. Mine only has the read facing jets. I was expecting to be able to blast through a clog, but I think with a gentle shove, on top of it pulling itself, it will get through most anything anyway. I also think, not knowing any better, that I might refer all the water facing the rear to help pull the cable through the pipe. A forward facing one might end up sending less pressure rearward. I THINK I prefer more force pulling the cable. Anyway...it worked for me and I love it. One of the better purchases I've made in a while. Thank you for your review. Unlike our shorter length drain cleaners, Handy Jetters come with a High Thrust Nozzle that has four back firing jets and no forward jet. This is needed to propel the drain cleaner its full 150 feet into most 4" ID drains. You can find more details on this product page. 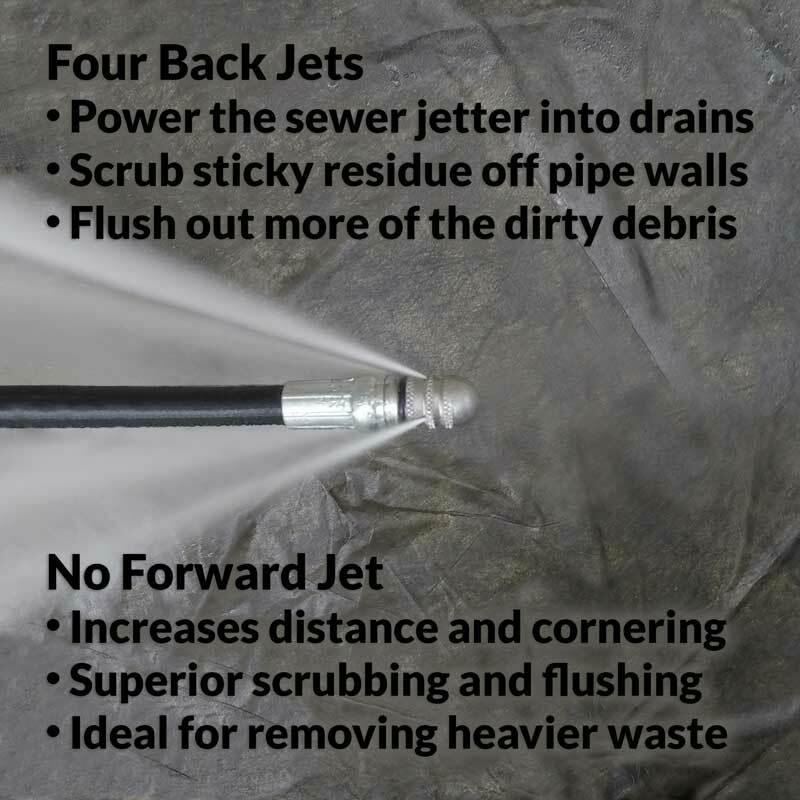 For drain cleaning projects where the may be dense, solid clogs like ice or hard packed clay within 100 feet of the drain opening, you can buy an optional Close Range Nozzle for Residential Handy Jetter that has a forward nozzle jet to help break through. Great product, easy to use. Needed to by additional length of pressure washer hose to run it outside with gas, but other then that, great product. Received the product in record time. It was a breeze to hook up and operate. 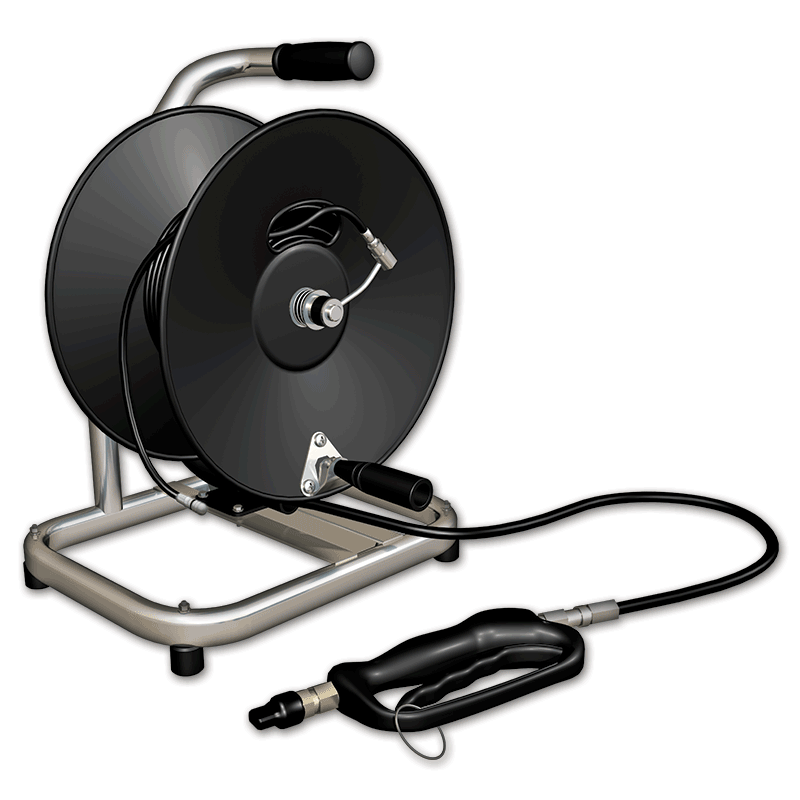 The reel makes using and storing the jetting line a lot easier. I have used this product mainly to clean out drainage tubing which usually gets blocked up with dirt and leaves. I was very pleased with its overall performance and easy operation. I would highly recommend this tool. The Clog Hog 150' is one of the best tool additions I have made in some time. It is as easy as connecting the wand to your pressure cleaner. The lightweight, independent system has its own hand control at the unit. This allows me to use my pressure cleaner hose for a better point of use. 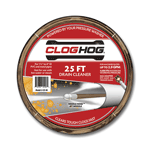 I can take the Clog Hog on a roof, into a kitchen, and even a bathroom without dragging the pressure unit with me. I highly recommend this tool. 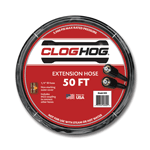 The combo package, Clog Hog long 150 foot hose on a easy to carry and use reel is a big winner. For the first time I enjoyed going out to a job and using my jetter equipment due to this product. Easy to use. Light weight. A must for any contractor. Much better than a snake!! I have iron algae in my sump pump discharge line. It builds up like clay and clogs the line which causes pump failure followed by flooding. I have been renting snakes for $75 a pop, annually. They are heavy (110lbs +) and difficult to operate. Also, commute to rental store twice each time! The Clog Hog is a Godsend!!! Bought the 150 Ft Residential Handy Jetter and it cuts through like melted butter. Twenty times less effort than with the 100 foot snake, and it is long enough for my 130 ft line. Cleans the line faster and better. I'm sure it's also easier on the pipe! One of the top 3 tools I have ever purchased! Thank you Clog Hog!!! This is my second Clog Hog. The 50' model worked great, however it wasn't long enough to handle some of my sewer lines. The 150' model cleaned out an 8" main that had about 70' of sludge in it. I could not be happier! I have had nothing but success with my Clog Hog!! It's been a great tool!! Kirk, thank you for your review. Your prior experience with sewer jetters probably has a lot to do with your success, since the 150 Ft Handy Jetter is definitely recommended only for experienced users.